Bell Shakespeare - Australian theatre company producing the plays of Shakespeare through incredible touring productions and education programmes. Also see Wikipedia article. Chicago Shakespeare Theater - Chicago's professional theater dedicated to the works of William Shakespeare. Illinois Shakespeare Festival - Known nationally in the theatre community as one of the top Shakespeare festivals. The Illinois Office of Tourism nominated the Illinois Shakespeare Festival as one of the top 120 attractions in the country. National Theatre (Royal National Theatre, London) - At its home on London's South Bank, the National offers classics (including Shakespeare), spectacular musicals, new plays and entertainment. The National houses three theatres - the Olivier, the Lyttelton and the Cottesloe - all under one roof. Also see National Theatre Live. Open Air Theatre - Since 1932, the Open Air Theatre at Regent's Park in London has become an established and much-loved highlight of Park life and of London's theatrical calendar. Oregon Shakespeare Festival (OSF) - Founded in 1935, the Tony Award-winning Oregon Shakespeare Festival is among the oldest and largest professional non-profit theatres in the nation. Each year OSF presents an eight-and-a-half-month season of eleven plays in three theatres plus numerous ancillary activities, and undertakes an extensive theatre education program. Operating on a budget exceeding $26 million, OSF presents more than 780 performances annually with attendance of approximately 400,000. Royal Shakespeare Company (RSC) - Probably the most famous classical theatre company in the world. This site has all the latest information on current and future productions, ticket sales, merchandising as well as press and educational resources. Shakespeare in the Park - Founded by Joe Papp, a premier summer theater since 1962. Location: Delacorte Theater in Central Park, New York City. Shakespeare's Globe Online - Founded by the pioneering American actor/director Sam Wanamaker, a unique international resource dedicated to the exploration of Shakespeare's work, and the playhouse for which he wrote, through the connected means of education and performance. Shakespeare Theatre, The - Since its founding in 1986, The Shakespeare Theatre in Washington, D.C., has dedicated itself to becoming the nation's premier classic theatre. Shakespeare Theatre of New Jersey, The - The state's only professional theatre company dedicated to the presentation of Shakespeare's canon and other classic dramatic entertainments for the cultural enrichment of the community. Stratford Festival of Canada, The - Stratford, Ontario is the home of the largest classical repertory theatre in North America. It draws audiences of more than 600,000 each year. Utah Shakespeare Festival - Presents nine plays each year from June through October. World Shakespeare Festival 2012 - Produced by the Royal Shakespeare Company, in an unprecedented collaboration with leading UK and international arts organisations, and with Globe to Globe, a major international programme produced by Shakespeare's Globe, it's the biggest celebration of Shakespeare ever staged. It runs from 23 April to November 2012 and forms part of London 2012 Festival, which is the culmination of the Cultural Olympiad, bringing leading artists from all over the world together in a UK-wide festival this summer. A Noise Within - Performs and educates the public on great works of world drama in rotating repertory using a company of professional, classically trained actors. Aesthetic Realism Theatre Company - Presents talks by Eli Siegel, founder of the philosophy Aesthetic Realism, on Shakespearean and other literary works. African-American Shakespeare Company - Based in San Francisco, the African-American Shakespeare Company's mission is to present European classical works within an African-American cultural context. British Shakespeare Company - Britain's largest and beloved open air Shakespeare company. California Shakespeare - Founded in 1974, the theater began as an artistic collective and has evolved into a fully professional theater known for its innovative productions of classic theater. From 1983 to 1995, it was guided by the leadership of artistic directors Dakin Matthews (1983-1987) and Michael Addison (1987-1995). During its 15 years at Berkeley's John Hinkel Park, such actors as Annette Bening, John Vickery, Douglas Sills, Julian Lopez-Morillas, and Lura Dolas appeared in over 53 productions, primarily of the plays of William Shakespeare. In 1991, the Theater built its current performance venue, the 545-seat Bruns Memorial Amphitheater in the hills between Berkeley and Orinda. Location: Bruns Amphitheater at 100 California Shakespeare Theater Way (formerly 100 Gateway Blvd., Orinda, California. Carolinian Shakespeare Festival - A grass-roots summer theatre program designed to enrich the lives of the people of Eastern North Carolina by making classic works of literature accessible to every one, especially the new generation. Chicago Shakespeare Theater (CST) - Chicago Shakespeare's work has been recognized internationally with three of London's prestigious Laurence Olivier Awards, and by the Chicago theater community with 62 Joseph Jefferson Awards for Artistic Excellence. Under the leadership of Artistic Director Barbara Gaines and Executive Director Criss Henderson, CST is dedicated to producing extraordinary classic productions, new works and family fare; unlocking Shakespeare's work for educators and students; and serving as Chicago's cultural ambassador through its World's Stage Series. GreenStage - Shakespeare in the Park in Seattle. GreenStage presents classic plays in a manner accessible to all. Livermore Shakespeare Festival - Committed to producing professional theater with two summer Shakespeare productions as well as contemporary plays. Location: Concannon Vineyard at 4590 Tesla Road in Livermore, California. Manhattan Shakespeare Project - Presenting the timeless themes and glorious language of William Shakespeare since 1995, growing each year into a premier regional event. Marin Shakepeare Company - Primary programs are at its mainstage summer season at Dominican University of California's Forest Meadows Amphitheatre in San Rafael. Additionally, there are year-round classes for students of all ages and Shakespeare events throughout the year. Mountain Shakespeare Festival - Theater company at the top of the Grapevine in Frazier Park, California that strives to offer the finest of entertainment in the midst of the mountains. North Carolina Shakespeare Festival - Producing the world's great classics, particularly the works of William Shakespeare, since 1977. Poor Players Theatre Company - A classical repertory theatre based out of San Diego. San Francisco Shakespeare Festival - Produced every year in San Francisco, Pleasanton, and Cupertino from July to October, Free Shakespeare in the Park provides an opportunity for over 30,000 people to see high quality, professional theater free of charge. Shakespeare on Tour brings a live hour-long Shakespeare performance to students throughout California. Tailor-Made Residencies bring San Francisco Shakespeare Festival's 30 years of educational and theatrical expertise to students for an immersive experience. Shakespeare Napa Valley - Free, fresh interpretations of Shakespeare plays in Veterans' Park in downtown Napa, California. Shakespeare Santa Cruz - A professional repertory company in residence at the University of California, Santa Cruz. Its festival was founded in 1981 and continues to be held annually each summer at UC Santa Cruz. Plays are held indoors on the UCSC Theatre Arts Mainstage and outdoors among the redwoods in the Festival Glen. Shakespeare's Globe - Founded in London by the pioneering American actor and director Sam Wanamaker, Shakespeare's Globe is a unique international resource dedicated to the exploration of Shakespeare's work and the playhouse for which he wrote, through the connected means of performance and education. Shakespeare Project of Chicago - The only free Shakespeare company in Chicago using all members of the Actors Equity Association. Wales Millennium Centre, The - Housing theatres for musicals, opera, ballet and dance, as well as cafes and arts organisations. Includes information about the building, organisations based there, news and what's on. Woman's Will - The San Francisco Bay Area's all-female Shakespeare company, exists to provide opportunities for women and girls to work together in a supportive yet challenging environment, to entertain and educate through high quality classes and performances, and to expand the boundaries in which audiences and artists see themselves. Absolute Shakespeare - Information on William Shakespeare's plays, sonnets, poems, quotes, biography and the legendary Globe Theatre. Folger Digital Texts - Reliable, expertly edited and encoded Shakespeare texts from the Folger Shakespeare Library editions. Folger Shakespeare Library - Located on Capitol Hill in Washington, D.C. A world-renowned research center on Shakespeare. Internet Shakespeare Editions - All plays and poems, both in quarto and folio form, are published in accurate, deeply marked-up old-spelling editions. A database of performance contains information about over 2,300 productions on stage and film. Also provides Shakespeare's Life and Times, an introduction to the world Shakespeare lived and worked in as well as links to additional resources. Shakespeare Electronic Archive - Now available at MIT, the Folger Shakespeare Library, and the Shakespeare Institute in Stratford-upon-Avon, this research archive includes images of all pages of the Shakespeare First Folio of 1623, including all press variants, all copies of Hamlet First Quarto (1603) and Second Quarto (1604/5), 1500 works of Hamlet art and illustration, and several digitized Hamlet films, including the Forbes-Robertson silent film (1913), the Ragnar Lyth Swedish TV film (1982), and the filmed record of the Richard Burton theater production, directed by John Gielgud (1964). Shakespeare Illustrated - A work in progress, explores nineteenth-century paintings, criticism and productions of Shakespeare's plays and their influences on one another. 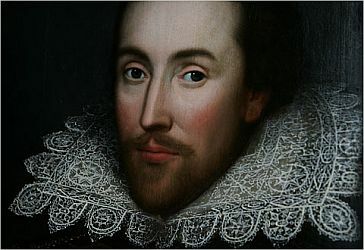 Shakespeare Online - Shakespeare information, including free play analysis, Shakespeare's biography, essays, answers to common Shakespeare questions, and a Shakespearean glossary. Shakespeare in Quarto - On this site you will find the British Library's 93 copies of the 21 plays by William Shakespeare printed in quarto before the theatres were closed in 1642. Shakespeare Search - Shakespeare line-oriented search engine. Also see Explore Shakespeare with Google. Shakespeare Study Guides - From SparkNotes. Shakespeare Theatre Links - From Shakespeare Resource Center. Shakespeare Resource Center - Collected links from all over the World Wide Web. Maintained by J. M. Pressley, who has a B.F.A. in Theatre Arts and an M.A. in Writing, both from DePaul University in Chicago, Illinois. World Shakespeare Bibliography Online - Provides annotated entries for all important books, articles, book reviews, dissertations, theatrical productions, reviews of productions, audiovisual materials, electronic media, and other scholarly and popular materials related to Shakespeare and published or produced between 1969 and mid-2002. The scope is international, with coverage extending to more than 92 languages and representing every country in North America, South America, and Europe, and nearly every country in Asia, Africa, and Australasia. The more than 83,267 records in this version cite several hundred thousand additional reviews of books, productions, films, and audio recordings.